Three stunning light blue sapphires sit in luxurious white gold that is filled with intricate Celtic knot work. 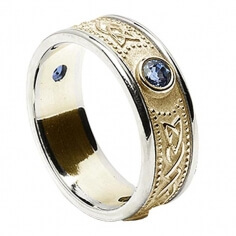 The detailing is of the highest quality as the ring is handmade by experienced, skilled Irish artisans. Every ring we craft is then sent to the Dublin Assay Office to be tested and stamped with approval.